I have the same. Xamarin 4.8.0.756. VS 2015. There is no error if the project is generated in an earlier version of Xamarin. What you mean earlier?can i downgrade? Projects generated in the version published before November. How can we avoid to install versions with bugs? Is there any way for downgrade in vs 2015? Update your Xamarin.Forms package to the latest, but don't update the Android.Support ones, They will be updated automatically with the Xamarin.Forms package because of the dependencies. Today I updated Xamarin for my Microsoft Visual Studio Community 2015 and I get the same problem. Until a month ago this problem did not arise. What happens is that I can build successfully the application and I can also deploy to my device without any problem, but when I write/edit the source code the error The name 'Resource' does not exist in the current context is always highlighted. The annoyance is that errors that do not exist are highlighted. I then cleaned the solution and I rebuilt it again. The recipe seemed to work. 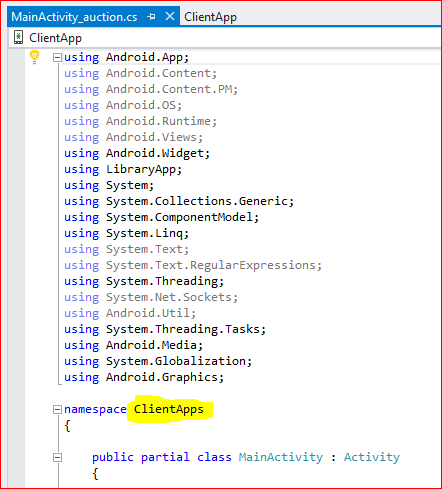 is your project Name is "ClientApp.Droid" in the Solution Explorer ? Had this issue too many times. There is no point playing around with the Resource.Designer.cs file because it's generated at runtime so you will have to keep repeating the process to fix it. You need to use a different Xamarin.Forms package and that will tend to fix it for me, also close Visual Studio and reopen it. 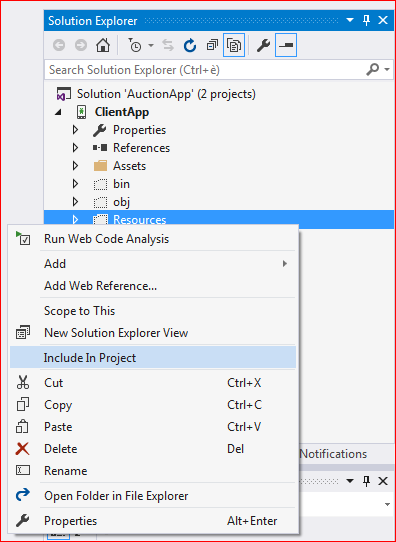 The project was created a couple of years ago (with that name and that namespace) and only now, after installing the latest version of Xamarin 4.8.0.756, the problem occurs. I've already tried to put the Namespace [ClientApp] before Resource but without success. I changed the Namespace from ClientApp to ClientApps, I changed also the Default Namespace from ClientApp to ClientApps, so I deleted the file Resource.Designer.cs, cleaned the solution and then rebuilt everything by adding the new regenerated file Resource.Designer.cs in the Resource folder. I successfully deleted the Resources folder from the project. I cleaned the solution then I closed the project and I restarted VS. I copied a copy of the same folder into the project tree and I included it again in the project. I made a clean install of Visual Studio and xamarin in default install version and problem solved. Same exact problem as others in here and has ground things to a near halt. Adding namespace identifiers in the code itself doesn't change anything because the resources class uses the default app namespace. I also got this when updating Xamarin tools this week. The process is hideous - make changes, do a build, run it - everything works. As soon as it's run once, then the Resource class can no longer be found...even if you do absolutely nothing else, like not a single keystroke. Then you can clean the project and try to rebuild it, and every now and then it will fix it, but many times now it doesn't. The only cure has been to close Visual Studio, restart, reload the project, do a clean, and rebuild. Every single time I make changes. This is totally unsustainable. I think its xamarin's bug. Probably it will be fixed in a new version. If someone from developers knows any way for fixing our problem please let us know. I tried using the installer to fix the problem. Did not help. I removed Microsoft Visual Studio Community 2015 [and whole Xamarin Tools] and installed Microsoft Visual Studio Community 2017 successfully. I opened my project that highlighted the problem by discovering that with this new version of the IDE the problem has disappeared. Experiencing this also. Got nothing done for two days. 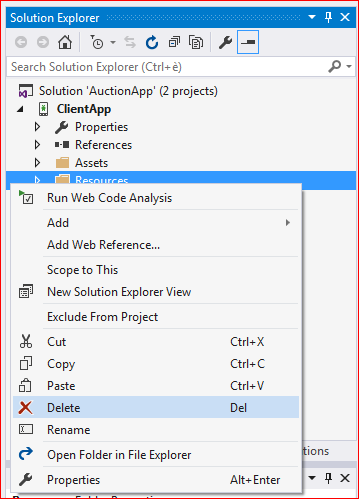 Any change in bugs occurred in visual studio 2015 ?????? So I had a number of issues (see my other post) and I installed VS Preview, and loaded it up, build a new project and it worked! 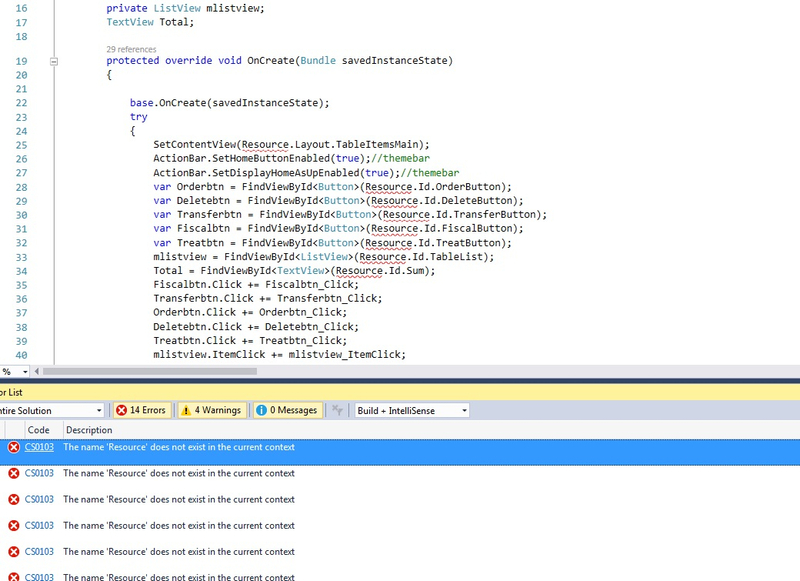 Joyfully I made my simple project then tried to change my Namespace to something more appropriate it was (XamDeleteMe) . That killed it. Nothing I can do has changed it. New project, new VS, still doesn't post. It seems to me that there is a second place that the Resource is moved to on build and in that place there is not a link to the resource designer, because there is no error until you build it. It seems nothing to do with what we can work with, but something behind the scenes in the build process is broken. I made a new project cut and pasted my code across again. built it every time. It worked. Then I added 2 buttons to the bottom of the activity. It died. Back to the same error. I'm having this same issue with everything up to date as of today, I don't think it's fixed. No it isn't fixed yet. Maybe in a future xamarin's version.